During the NATO bombing of the Federal Republic of Yugoslavia, also known as “Operation Allied Force,” two people “meet” on an internet newsgroup – one is a woman in Yugoslavia, watching her homeland being bombed by NATO forces. The other is a man living in the USA – watching from afar. As they argue the different sides of what they see and believe is right, they discover a connection that is stronger than their disagreements, and surpasses the physical distance between them. This is the story of Letters from the Fire written by R. A. Deckert (aka Deck) and Alma Hromic. First of all, this novel is told almost entirely through the fictionalized postings to an internet newsgroup and email correspondence, making it probably the first electronic epistolary novel ever written. While this book was published in 1999, just after the fighting ended, it developed in real life, just as it plays out in the book – via the internet. What drew me to this book was that I actually watched much of this story unfold before my own eyes, on the same newsgroup (misc.writing) that the authors were actually frequenting. When someone on the group suggested that they put their real frustrations into a fictional story, Letters from the Fire got started. This also cemented their personal relationship, leading Alma to move to the USA from New Zealand and marry him. While in real life, Deck and Alma took much the same side politically regarding the NATO operation, in order to bring more spice to the book, they decided to pit the fictional Dave against the fictional Sasha, politically. And while Alma wasn’t living in Novi Sad at the time of the bombings, it made more sense to put Sasha right on the front lines. But what this book concentrates on besides the bombing, is the people who communicate almost half way across the globe, and how such a relationship can grow despite never meeting face-to-face. The story begins with Sasha’s postings about her horror at the destruction of a bridge in Belgrade. But while that bridge was destroyed, as the book progresses, a new, more emotional bridge is built between Sasha and Dave. With such a personal story that almost parallels the real-life one, one might worry if the authors could keep from being overly involved, and fall into the trap of this becoming more of a love story than a story about two people who connect on different levels during a difficult time. Fortunately for us, these two were (and are) true professionals, and kept the romantic part of the story as a byproduct of the action, rather than the central theme. In this way, their relationship becomes even more poignant, since it seems something that they both resist, but equally find irresistible. Since Deck wrote the entries from Dave and Alma wrote the entries from Sasha, there is no problem with the readers identifying two very distinctive voices here, and very quickly you’ll be skipping over the “headings” of the entries which state clearly who the author is. Since these characters are based completely on the authors themselves, they quickly become some of the most vivid people you’ve ever read about. This makes reader empathy for these characters almost mandatory, and I dare you not to feel the tugs at your heartstrings as you read this novel. Again, this isn’t a mushy romantic novel, and could never be put in the category of “Chick-Lit,” but the emotions that this story evokes are, I believe, completely undeniable. But perhaps you think I’m overly attached to this book because I “know” Deck and Alma from the newsgroup. In all honesty, I don’t think that this is the case. If nothing else I’ve said recommends it, I’d say that this novel was a breakthrough on writing about the internet age. The fact that the bombing of the FRY is long over, doesn’t mean that we can’t imagine something similar happening in other wars across the world. The internet has made this globe a much smaller place than it ever was, and this book poignantly shows just how close we can become, despite the distances between us. I couldn’t give it less than a full five stars and highly recommend it. 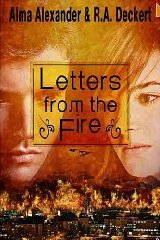 Letters from the Fire has just been re-released as an eBook, available from Amazon US and Amazon UK. No Comments on "Letters from the Fire"